This issue is now also available in print and on iOS for iPad, iPhone, and iPod Touch. Welcome to Laser Magic™ 1998, “The Ultimate Widescreen Video Disc Guide!” This massive piece has been a work in progress for over two years. It was envisioned to serve as an authoritative and essential home theatre resource focused on DVD and LaserDisc optical storage mediums. Laser Magic has two components to its contents: 1) articles which cover the history of optical disc invention and the particulars of the DVD and Laser Disc formats, and 2) an evaluation of the end product experience described through review synopses, with picture and sound quality scores and picture format and soundtrack data indices cross referenced to previous issues of Widescreen Review. The latter component includes synopsis reviews of 1,982 LaserDisc titles reviewed since Issue 1, which was first published in November 1992, and 291 DVD titles reviewed since September’s 1997 Issue 25 through June 1998’s Issue 28. For those readers not familiar with Widescreen Review magazine, movies on disc are evaluated and scored according to picture and sound quality presentation. The value range is “1” BAD to “5” EXCELLENT. A FiveFive score represents reference quality for the particular time frame of release. Thus, a title that received a P5 and S5 score in 1992 may be considered less than reference quality by 1998 disc standards. One of the data indices, entitled “Gary’s Best DVDs And Laser Discs,” is a record of every title that has ever received a FiveFive picture and sound score, referenced to the particular issue in Widescreen Review in which the title was reviewed. As our scope is “the movie experience” presented in its original intended “widescreen theatrical format,” as viewed on widescreen display devices, only those titles released on DVD or LaserDisc in a widescreen aspect ratio are reviewed. For the complete review, readers are directed to the original magazine issue. For a master index to all the 2,273 titles reviewed since 1992, we direct our readers to the DVDiscography™ and LaserDiscography™ in Laser Magic. As a further resource to our readers, we have researched and compiled a comprehensive “Widescreen Filmography” of every known widescreen formatted film from 1926 through July 1998, and cross referenced each title to available discs and reviews. We also have included our “Widescreen DVD Releases” DVDiscograpy identifying 291 DVDs reviewed out of 566 released and/or announced by publishers and studios/distributors. Additionally, Laser Magic contains a “Digital Sound Filmography,” which lists every movie released in North America with a digital soundtrack by format - Cinema Digital Sound, Dolby® Digital, DTS® Digital Sound, and Sony Dynamic Digital Sound® - through July 1998. 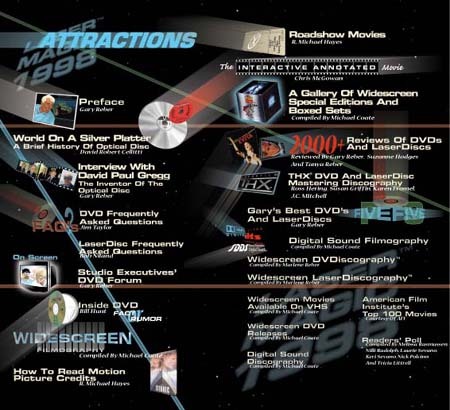 In recognition of the contribution to disc presentation quality that the THX® division of Lucasfilm has made, we present at the back end of the “THX Digital Mastering Program” article, a current through July 1998 index of THX-certified titles released on LaserDisc, DVD, and VHS, cross referenced to reviews in Widescreen Review. The article, which originally appeared in Issue 5 and was written by S. Ross Hering and Susan Griffin, has been updated for this special edition by Karen Fromel and J.C. Mitchell. Editorially, Laser Magic is packed with insight into optical disc invention and the resulting LaserDisc and DVD technologies that form the basis for both players and discs. I want to personally thank David Paul Gregg, recognized to be the “Father of the Optical Disc,” for graciously spending an afternoon with me covering the historical perspective and politics surrounding optical disc technology. And what a wonderful piece of work that David Robert Cellitti wrote on the history of the optical disc, entitled “World On A Silver Platter.” This article uncovers the politics of industrial competition aimed at the prize - “patent ownership,” and thus, royalties. Jim Taylor, our DVD Evangelist, deserves special recognition for putting together the most comprehensive “FAQ” article on DVD that I have ever read, and as well, Bob Niland for his superb “LaserDisc FAQ” article. Chris McGowan, one of the magazine’s contributing editors, wrote the excellent piece on “The Interactive Annotated Movie,” which covers the interactivity features of DVD and LaserDisc. And “Mr. Research,” our own Michael Coate, is to be commended for putting together “A Gallery Of Widescreen Special Editions And Boxed Sets” and for his extensive compilation research, which is published throughout Laser Magic. Also, my appreciation goes out to R. Michael Hayes for writing two very enlightening articles entitled ”Roadshow Movies” and “How To Read Motion Picture Credits.” Executive Publisher, Marlene Reber merits special recognition for her meticulous creation of our definitive Discographies. Lastly, Suzanne Hodges, our Film Review Editor, deserves your applause for her superb review work and Jim Bertz for his graphic design creativity, as well as the dedicated WSR staff.